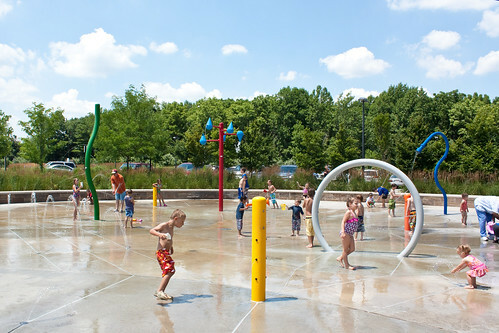 In addition to all of the fun to be had at The Waterpark at the Monon Community Center, there are three parks in Carmel that offer splash pads beginning Memorial Day weekend until temperatures begin cooling in late September. Like their adjacent playgrounds, the splash pads are free and open daily from sunrise until sunset. Conner Prairie River Crossing Area*: 13400 Allisonville Rd, Fishers Open May 27-Sept. 5. Younger visitors will love the splash and play water area that includes safe, fun water cannons. Dillon Park: 6001 Edenshall Ln, Noblesville, Open Memorial Day Weekend until end of September, weather permitting. Mulberry Fields: 9645 Whitestown Rd, Zionsville, Open daily the Friday following Memorial Day through Tuesday after Labor Day. Forest Park*: 701 Cicero Rd, Noblesville Splash pad included with paid admission to the aquatic center. City Center Park: 415 Lincoln St. Greenwood, Open daily sunrise to sunset, Memorial Day through Labor Day. Freedom Springs Aquatic Park*: 750 W. Stop 18 Rd, Greenwood, Splash pad is located within the Aquatic Park. Open Memorial Day through Labor Day, Mon-Sat 11 am-8 pm; Sunday noon-6 pm. Gill Family Aquatic Center, located at Ellis Park: 600 E. Main Street, Danville, May 26- August 7. Hummel Park: 1500 S Center St, Plainfield, Splash pad is open 10 am-7 pm daily from approximately Memorial Day through the end of September, weather permitting. Intended for use by children ages 12 and under. Washington Township Park: 312 Whipple Lane, Avon, Splash pad is open Memorial Day weekend through Labor Day, Mon-Fri Noon- 8:00 pm; Sat-Sun 10:30 am-6:30 pm. Williams Park: 940 S. Locust Lane, Brownsburg. Open daily May through Sept., 10 am-7pm. Kids will love this massive splash pad with 2,500 square feet of water play! * Access to these splash pads is FREE with paid admission. All others listed require no admission fees.